Sticking to a low carb diet while camping doesn’t have to be difficult or take a ton of prepwork. 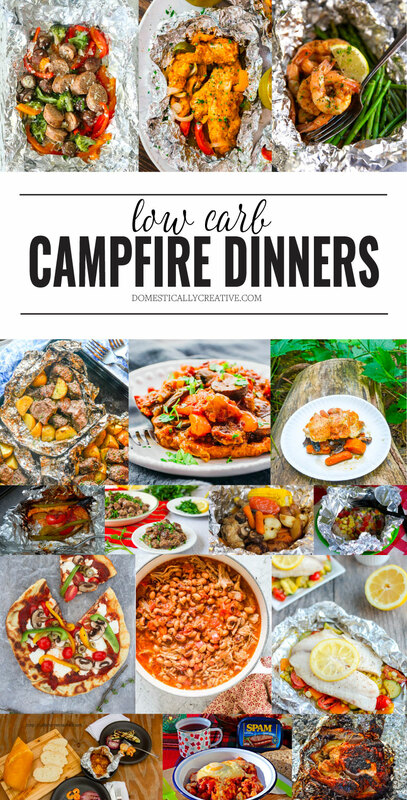 These low carb campfire dinners are so easy to make and most of them can be made up ahead of time for a simple no fuss dinner. My husband and I love to camp! 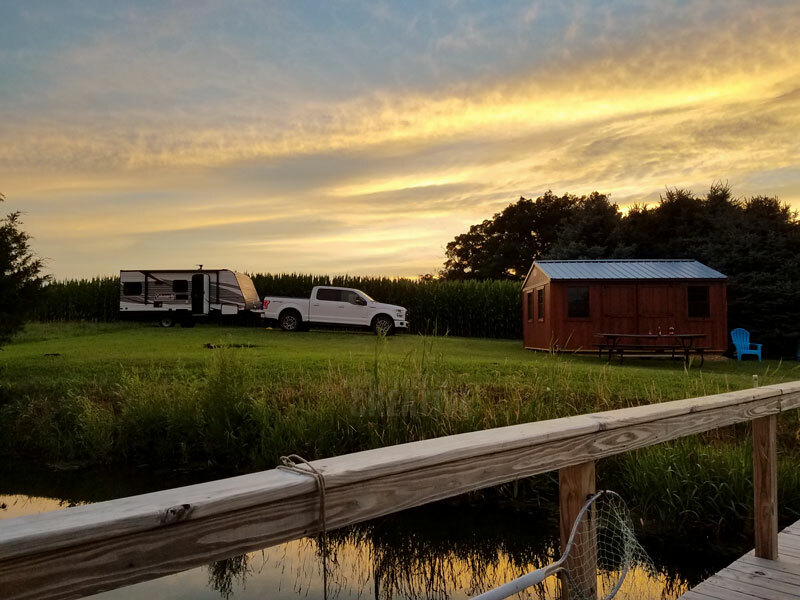 We had talked and talked and talked for YEARS about buying a little pop-up camper so we could get out even more. Well at the end of last season we finally bit the bullet and purchased a camper. Instead of a pop-up we went all out and bought a small 17′ travel trailer. It’s the perfect size for just us and our 8 year old lab to fit comfortably. We’ve been out several times this year already and even have a fun 10 day trip to Colorado planned in a few weeks! One thing that I was worried about when we first started going out this season was what we would eat. Yep, my first thoughts no matter what the situation, is always on food. Following a low carb diet can take a little more thought when you are away from home, but it really doesn’t have to be difficult. In fact, we absolutely love just heating up some no bean canned chili and hotdogs, topping it with cheese, onion and mustard, and calling it dinner. I’ll usually bring along some cut up cauliflower, broccoli and carrots with some french onion dip. It’s easy, fast, filling and doesn’t take up a ton of cooler or fridge space. Because let’s be honest, that valuable space is better used for alcohol right? So with our long trip coming up, I’m starting to brainstorm what to eat while we are camping. 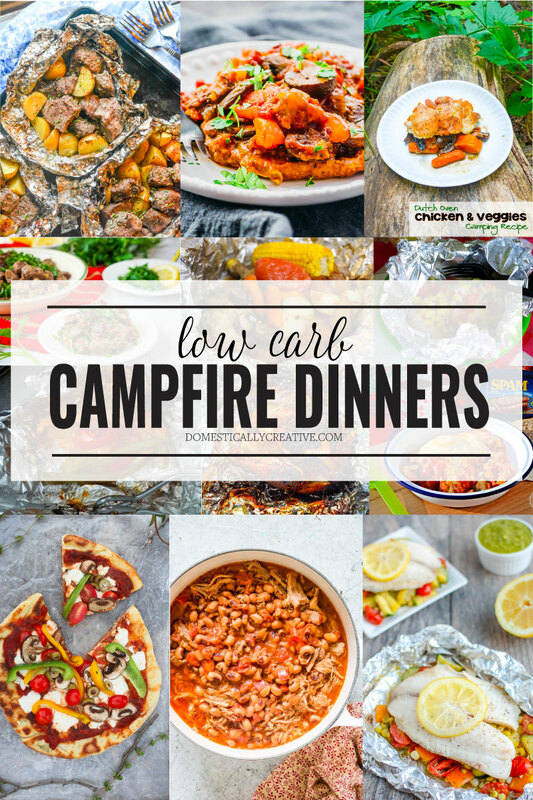 Since it’s a longer trip, I’m sure we will get sick of our normal fare, so I’ve rounded up these easy and delicious low carb campfire dinners to share with you! Foil packets are one of the easiest ways to make dinner while camping. Here’s some of the best recipes I found! Campfire Grilled Chicken and Veggie Foil Packet | Intelligent Domestications–trade out the potatoes for a more carb friendly veggie. 30 Minute Foil Packet Chicken Fajitas | The Life Jolie–Use low-carb tortillas, or just make a fajita bowl with no tortilla to keep it low-carb. Grilled Butter Garlic Steak and Potato Foil Pack | 4 Sons ‘R’ Us–Leave out the potatoes and add in some broccoli or your favorite veggie. BBQ Chicken and Veggie Foil Packets | Thrifty Jinxy–Use a sugar free BBQ sauce and you are good to go. Make these dishes up in a Dutch Oven hanging over the fire for an easy, delicious meal made just for camping! We absolutely love our tripod which makes sitting a pot or Dutch Oven over the fire a breeze. You can also get one for hanging a pot too! Campfire Pizza | Champagne Taste — I’m thinking you could make a fat head or cauliflower pizza crust to cut back on the carb count! These all sounds so good! Foil dinners are always great.